This easy mixed berry dessert sauce recipe takes all of 25 minutes to prepare and can be served hot or cold on blintzes, pound cake, ice cream, and more. In a medium saucepan, combine 1 cup fresh or frozen raspberries, 1 cup fresh or frozen sliced strawberries, 3/4 cup fresh or frozen blueberries, 3/4 cup sugar and 1 tablespoon fresh lemon juice, and bring to a simmer over medium heat until sugar has dissolved, about 10 minutes. Adjust sugar, adding up to 1/4 cup more (or to taste) if necessary, and cook until dissolved. Purée the berry mixture in a blender or food processor and return to the saucepan and bring to a simmer. Add an additional 1 tablespoon fresh lemon juice, or to taste, if necessary. Add remaining 1/2 cup fresh or frozen raspberries, 1/2 cup fresh or frozen sliced strawberries and 1/4 cup fresh or frozen blueberries, and simmer until sauce is hot. 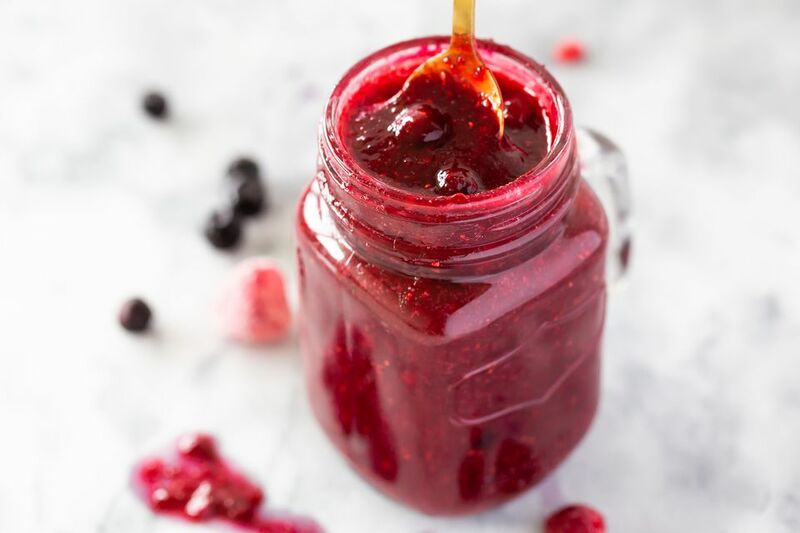 This recipe works as well with frozen berries as it does fresh, in-season berries that can include raspberries, strawberries, blueberries, blackberries, marionberries, gooseberries and others. Let your taste be your guide.